A trio of fast-moving wildfires threatened nearly 200 homes in western Montana on Monday, but the flames were not expected to stop thousands of people from coming to the area for a quirky food festival this week. Rodney Lincoln said he had been told the fires were moving away from his Rock Creek Lodge in Clinton and would not affect the Testicle Festival, which attracts people from around the world eager to consume deep-fried bull testicles known as "Rocky Mountain oysters." "There's some smoke, but in terms of flames, compared to last night it's pretty mellow in my estimation," Lincoln said. "A little smoke isn't going to hurt us. It's not going to deter people from coming." Two of the area fires, believed to be human-caused, were detected over the weekend, and one has been burning since a lightning strike July 15. Residents of about 40 homes were asked to leave the area east of Clinton Sunday night as a 1,000-acre blaze — about a square mile — burned along Interstate 90. July has been "the hottest month ever recorded across much of Idaho and Montana," says CBS News meteorologist George Cullen. To the south, campers and residents of another 40 homes west of Philipsburg were asked to evacuate in advance of a 1,000-acre fire there. About 40 outbuildings also were threatened by the blaze, and crews were placing protective fire wrapping around the structures on Monday, said Nick Spang, fire information officer. Erratic winds were expected as a cold front moved through the area. "We're not letting anyone up there unless they're going up to there to collect belongings," he said. A third fire in the area has been burning for more than two weeks but flared up recently, Spang said. 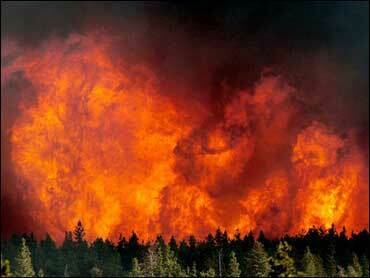 Granite County authorities were prepared to evacuate as many as 100 homes threatened by the 300-plus-acre wildfire. Elsewhere around the state, a fire north of Helena grew to nearly 15,000 acres on Monday under "extreme" conditions, said Bonney McNabb, fire information officer. "The weather's just not been a very good friend to us," McNabb said. "But the next couple of days are supposed to be better." A huge plume of smoke from the fire was visible from Helena and Interstate 15. Evacuation orders remained in effect for 40 homes along the Missouri River and the Gates of the Mountains Wilderness. The surrounding recreation sites also remained closed. The state's largest fire, west of Augusta, increased to 45,000 acres — or 70 square miles — on Monday, more than doubling in just 24 hours, officials said. Most of the new burning occurred in the Bob Marshall Wilderness. Some residents in the Gibson Reservoir area, on the northeast corner of the fire, left on their own, said fire information officer Jean Withnell. The blaze, burning since July 11, crossed fire lines in several other areas and was heading toward Benchmark in the western part of the state, fire managers said. South of Glacier National Park, a fire doubled to 10,000 acres Monday and burned to within a mile of the Blackfeet Indian Reservation and within 3½ miles of 10 to 15 homes, said fire information officer Dale Warriner. A contract vehicle supporting the fire was involved in a rollover near the fire camp, Warriner said. Two people were taken by helicopter to a hospital, where one was treated and released and the other held overnight for observation. Montana and Idaho each had more than a dozen fires, far more than any other state, according to the National Interagency Fire Center. Idaho has seen far more land burned, but its biggest wildfire by far, a 1,020-square-mile blaze that at one point threatened two small towns along the Nevada line, was expected to be completely contained by Tuesday morning, said fire information officer Bill Watt. Rain last week helped crews battle the two-week-old fire, which destroyed three outbuildings and killed an unknown number of cattle. Elsewhere, a wildfire started Sunday afternoon in eastern Michigan's Huron National Forest and damaged at least three homes before firefighters contained it at about 500 acres, police said. About 100 people were evacuated, although nearly all were allowed to return to their homes by Sunday night, said state police Sgt. Tim Gronda. Authorities say the fire, about 130 miles north of Detroit, was contained but not yet controlled. "Within a four-mile radius, nothing is left unburned — it just took everything," said Carol Nilsson, fire information officer for the national forest. "It was a very fast-moving fire and did a lot of damage." In California, a nearly month-old wildfire in Santa Barbara County that had appeared to be standing still flared up over the weekend, burning 1,500 new acres and causing an evacuation order for a dozen rural homes, authorities said. Warm and extremely dry conditions allowed the fire to burn through old, heavy trees in the Los Padres National Forest on its uncontained southeast side. The blaze had consumed about 33,500 acres, or 52 square miles, since it started July 4. It was 70 percent contained Monday. The U.S. Forest Service has moved its fire-warning level for Southern California from "very high" to "extreme," the second-highest category. "If you look at the field types, the field moisture is the lowest I've ever seen since I've been in Southern California," said USFS Fire Prevention Officer Jim Hall.